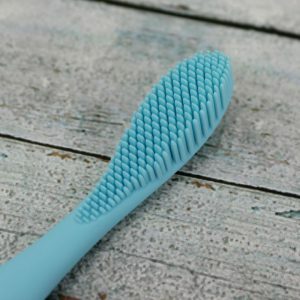 I have recently been blighted by pictures and Ads about the Foreo Issa Toothbrush and have decided to give my opinion on this brush, see what all the fuss is about. What Is Foreo Issa Toothbrush? Foreo is a Swedish multinational brand founded in 2013. It is a beauty brand producing skin care products and bespoke electric toothbrushes. The company has won numerous awards and is very forward thinking when it comes to product design as you can see from the brush above. It’s a cross between electric and manual toothbrush. Lets not wait any longer and get straight into the Foreo issa toothbrush review! At first glance this toothbrush seems to come across as very simple and aimed at the younger generation of hipsters, but don’t be fooled…. It has some excellent features which makes it suitable for any one who has sensitive teeth and gums. This is because it has silicone bristles which are very smooth and soft to the touch. Whats more remarkable is the antibacterial silicone heads only need changing once a year compared to 3 months for other electric toothbrush brands. Built in timer – this lets you keep track of the brushing time. This is important because the majority of people brush nowhere near the recommended 2 minutes. 8 intensity settings – The settings can be adjusted so you are using the most comfortable speed for you. The number 1 feature is the design of the brush, it’s very unique and trendy and attracts alot of attention. The material is unique to this brush only. it’s high quality PBT polymer and silicone offers a soft touch which is easy on the gums. Battery life is pretty good with a single charge lasting a year. Large brush head is quite hard to fit into your mouth and around the back of the teeth. conclusion is you will be bound to miss some spots. And Finally, this is the big one….. PRICE! 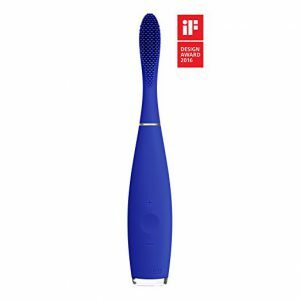 This brush is so overpriced for what it actually is and compared to other similar priced electric toothbrushes it has less features warranting a price tag of $149.00. I have read many reviews from other people and they all say the same thing: It’s a good toothbrush but too expensive and i will agree with them. There are cheaper electric toothbrushes out there which have a higher power output with loads more features under $100. Take for example the Oral B 5000 which is a solid brush for anyone looking for the next step in their mouth hygiene journey. I might be a bit bias because i own the oral b 5000 but it really is a good all rounder, thats why i recommend it. This is the general consensus, that the brush is overpriced and many people have stated it has broken in half not a year after buying it. Maybe it’s a ploy for the company to have it break routinely so you have to keep buying it over and over again, although you would have to be seriously stupid to do that. Is It A Good Long Term Investment? I think i speak for everyone including dentists when i say that Foreo does not have the same track record of other big brands such as Oral b and Phillips Sonicare. But the quality of the finished product cannot be questioned. The silicone material gives it great grip and feels better than holding plastic in your hands and it’s completely water resistant. It comes with a 2 year warranty but whats great is the 10 year quality guarantee they offer. What this means is, if a defect occurs on your Foreo brush after the initial 2 year period but within the 10 year quality guarantee you will able able to get 50% off a new product. This clearly shows the company is really focused on customer satisfaction and firmly believes in their product. Although it has some excellent features mentioned above, i am not sold on the Foreo. The main reason being the price is too much especially compared to some of it’s competitors which are priced lower and provide more features. The other thing that sways me away is the amount of negative reviews this brush has on amazon. 21% are 1 star reviews and only 42% are 5 stars. The average is 3 stars which makes it adequate. I will stick with the more trusted brands such as Oral b and Phillips sonicare and because most of their products have on average a rating of 4 – 5 stars. Q. Is The Foreo Issa suitable for anyone with orthodontics ? A. Yes, the brush has very soft bristles that will cause no harm. Q. Where is it made ? A. The toothbrush is built in china but all the different components are made in Sweden. Q. Does it come with a travel case ? A. Yes it comes with a plastic pocket carrying case which is ideal for travelling with. Q. Does it come with a charger ? A. Yes it comes with a USB cable and connector. Q. How long does the battery last ? A. Battery lasts upto a year when used twice a day everyday. Q. Does It have Bluetooth connectivity ? A. No it does not have the capabilities for connecting via Bluetooth. Q. Where can i buy the Foreo Issa Toothbrush ? This looks so different to any other kind of brush that I have ever seen in my entire life. The thinness of it at the top and the way it is curvy at the bottom, this definitely stands out to the eye. The technology looks crazy though, the front is made of silicone. What is this like have you used it before? Hi Josh, thanks for your input. the first time i saw it i was bamboozled aswell. it looked anything but like a toothbrush but it has to be one of the funkiest currently on the market. The silicone bristles are what makes it unique and they are gentle on the gums, but as far as technology is concerned, there are other electric toothbrushes which are way ahead of the Foreo Issa such as the oral b 7000. To be honest i prefer the oral b brand more than others, they just work so well for me. What toothbrush do you use? I just tried this toothbrush And I hate it with the passion of 1000 suns. What a waste of money. It’s been 10 Minutes and the insides of my teeth still hurt. It was like holding a steel rod up to my teeth and just letting it vibrate until my fillings felt like they were gonna fall out. And my teeth didn’t even feel clean after! I don’t know who thought of this, or why they thought it was a good idea, but it’s the stupidest thing I’ve ever encountered in my life. The first time i looked at it, i was thinking this ain’t going to be better than oral b or the sonicare brands and just ignored it. The comments were also a mixed bag. I currently use the Oral b 5000 and it does a fabulous job. You might want to consider something similar.